A bright but blustery Sunday morning has turned into a rather dark, threatening afternoon. Icy plops of rain are falling and the bare birch trees across the road are swaying in an increasingly strong wind. I don’t mind though. Marco’s been walked and I’ve already been for a run. There’s nothing I need do other than read my book (The Accidental Tourist by Anne Tyler), drink peppermint tea and make soup for the week ahead. Nice. Today’s soup will be a wintery minestrone (this one). More often than not, however, I’ve been making the below soup. It’s David’s current favourite. He likes his soups hearty and, in this weather, so do I. Add a splash of olive oil to a large pan. Throw in the chorizo and cook over a medium heat until the chorizo releases its fat. Add the onion and celery and cook for a further 15 minutes, stirring occasionally. Add the garlic and smoked paprika. Cook for a couple more minutes then add the chickpeas and brown rice. Stir well. Finally, add the tomatoes, spinach and stock. Simmer gently for an hour then taste for seasoning. It’s unlikely to need salt but a grinding of pepper would be good. This entry was posted in Food, Recipes and tagged chorizo, soup, winter. Bookmark the permalink. Nasty day here in Dublin too. Started out OK but went downhill faster than a car with a broken handbrake. sounds and looks fab. would have liked it to be a bit blustery for my run in dubai on the weekend-no chance, bloody hot! 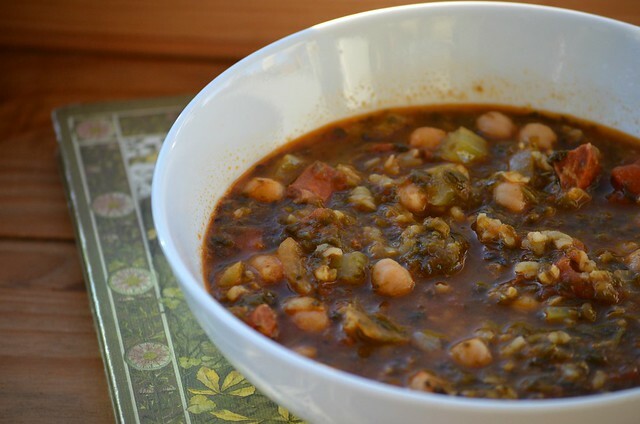 I always love this soup and sometimes make it with Swiss chard , if I can get hold of some . Kale though , I’ve found , isn’t quite right ! I must investigate Winter Minestrone …. it’s not below freezing any more but hearty soup’s always welcome in the winter here . Nice and frugal and utterly delicious! Smashing soup! Im always on the lookout for new soup recipes, especially ones with chorizo in it. I’m definitely needing to try this out next week! Now THAT’s a soup…it’s got some heart and weight to it, rather than brothy nothingness! I made this soup last week, and it was greeted with some serious thumbs up. It’s very filling, and more spicy than you’d think just looking at it (always a bonus). But you have to like spinach! This was really nice! I must say it tasted better than it looked…but thats because i added a tin of chopped tomatoes to bulk it out and used frozen rather than fresh spinach which did not look quite as appetising.